Come, Holy Spirit, fill the hearts of your faithful, and enkindle in them the fire of your love. Send forth your Spirit, and they shall be created and you shall renew the face of the earth. O God, who instructs the hearts of your faithful by the light of your Holy Spirit, grant us by the same Spirit to be truly wise, and ever to rejoice in His consolation, through Christ our Lord. Amen. We are called by the Lord Jesus to love and serve His Church through prayer, evangelization, encouraging growth in the Spirit, and doing corporal and spiritual works of mercy, empowered by the gifts and graces of Pentecost for the glory of God the Father. 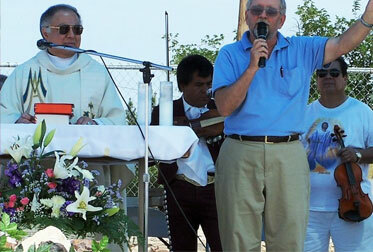 of the Bishop of El Paso. regardless of race, religion, or state in life. Open Arms is a 501-c-3 religious and charitable organization. Leadership is Roman Catholic, but everyone is welcome. Open Arms began in 1972. 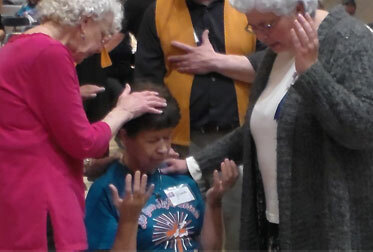 A group of Catholics who had recently experienced a personal Pentecost met to pray. We wanted to share the blessing of the “baptism in the Holy Spirit.” Our numbers grew and over the years, we met in several different parish halls. We are part of the worldwide Catholic Charismatic Renewal, a Spirit-inspired grassroots revival that began among American Catholics in 1967. We have sponsored Charismatic Conferences in the El Paso Diocese for some forty years as well as Life in the Spirit Seminars and Retreats. In 1993, we purchased an old adobe dance hall, now our Charismatic Center. It houses our office, prayer chapel, bookstore, Catholic library, hall for weekly prayer meetings and Bible studies in English and Spanish, thrift store, and ministry to the poor. 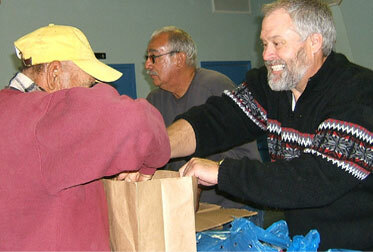 Our Food Bank serves 800 needy families a month. We were inspired in 2000 to buy a large property next door where, with God’s help, we will build the Holy Spirit Retreat and Renewal Center. We are empowered by the Holy Spirit through the gifts and graces of Pentecost.